Classes are not mandatory to start an adventure, and can be selected at any given time. 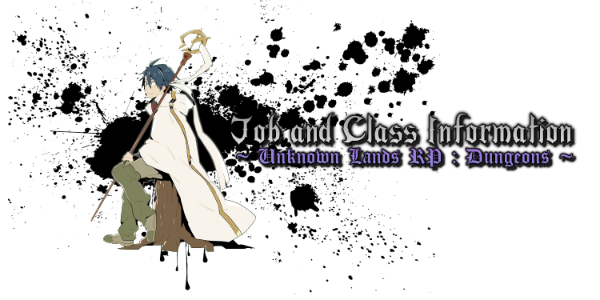 Each class has a unique set of bonuses that give user's an edge in the Dungeons. These are considered "blessings" as they have no power or role on Pandora itself. These are skills and abilities granted for only use in help defending Pandora, by clearing dungeon floors. If you take the class of a Defender, or as others call them a "Tank", you will find yourself with a higher defense and strengthened body. While you may not deal more damage like some other classes, you will be able to self sustain longer in the dungeons. Often rare to see, Buffers are specialty personnel that focus on boosting party stats, or lowering enemy stats. Duration of all buffs and debuffs are increased by 50%, with a minimum of a single post. This does not effect cooldown, and can be stacked if the cooldown is shorter than the new duration. One of the Specialty Classes, being a Healer makes you rely on others, but with your recovery abilities, they'll need you more than you need them. All healing spells that do not target the caster, are doubled. User recovers 5% HP at the end of every post, this does not take effect if the user is killed or defeated in combat. This will not stack with other passive abilities that heal the user. Some people prefer to keep the fight away from them. These are Rangers, and are typically distance focused. All ranged spells have 50% more range. All ranged weapons will have 50% more ammunition if owned by the Ranger. All thrown weapons will deal 50% more damage.